The Obama administration is giving the world more reason why no sovereign nation should allow a U.S. citizen inside its borders. A drone attack on that U.S. citizen will be an attack on that country! An internal Justice Department memo says it is legal for the government to kill U.S. citizens abroad if it believes they are senior al-Qaeda leaders continually engaged in operations aimed at killing Americans. The document, reported Monday by NBC News, provides a legal rationale behind the Obama administration’s use of drone strikes against al-Qaeda suspects. The 16-page document says it is lawful to target al-Qaeda linked U.S. citizens if they pose an “imminent” threat of violent attack against Americans, and that delaying action against such people would create an unacceptably high risk. Such circumstances may necessitate expanding the concept of imminent threat, the memo says. “It’s hard to believe that it was produced in a democracy built on a system of checks and balances,” the ACLU said. The document says that the use of lethal force would not violate the Fourth Amendment of the Constitution when a targeted person is an operational leader of an enemy force and an informed, high-level government official has determined that he poses an imminent threat of violent attack against the U.S.
“Under the circumstances described in this paper, there exists no appropriate judicial forum to evaluate these constitutional considerations. It is well established that ’matters intimately related to foreign policy, and national security are rarely proper subjects for judicial intervention,”’ the white paper said. “The condition that an operational leader present an ‘imminent’ threat of violent attack against the United States does not require the United States to have clear evidence that a specific attack on U.S. persons and interests will take place in the immediate future,” NBC reported the memo as saying. The Obama administration wants to kill U.S. citizens based on its belief that they are a threat to the United States. The administration does NOT want their decision to be reviewable in the courts. How is the issue of “threat to the United States” to be determined? What about the issue of sending drones into the sovereign airspace of other countries? The U.S. does not seem to be considering this aspect of the problem. 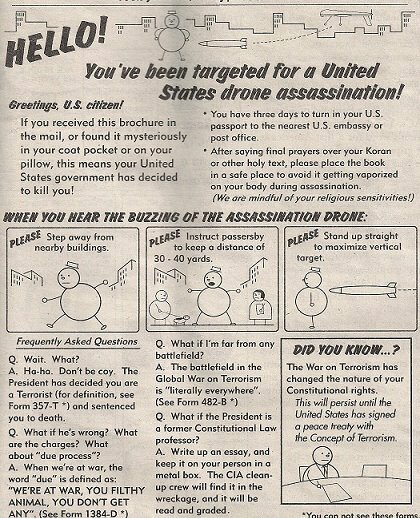 Would the Government of Canada allow the U.S. to send a drone into Canadian airspace to kill a U.S. citizen in Montreal? Sound far fetched? The drone program is one more reason why no country should allow U.S. citizens inside its borders. Why invite the “Drone attack”? Conclusion: The Obama administration has gone completely out of its mind! This should be a “wake up call” for the rest of the world! This entry was posted in Are you a U.S. citizen?, Constitutional issues, Land of the free on February 5, 2013 by renounceuscitizenship. The New York Times has taken the initiative to write a very good article on the “Drones Issue”. CIA Ran Secret Base in Saudi Arabia http://t.co/Dh83erl0 #Drones get a moment of light in #CIA Director hearings. Do American's Care?